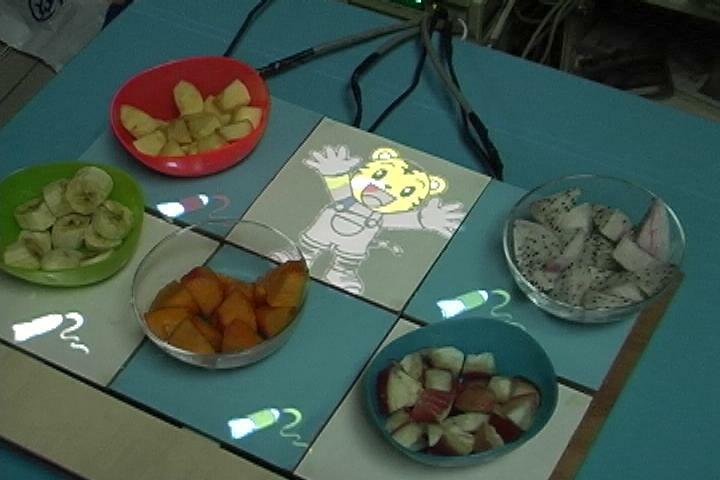 We have explored the design of an interactive, persuasive game to assist teachers to improve dietary behaviors of kindergarten children. The persuasive game is played over a smart lunch tray. The smart lunch tray incorporates both context-awareness and interactive media persuasion, enabling the creation of a persuasive smart object. We show a context inference sheme that realizes a user posture inference with only one acceleration sensor embedded in a mobile handset. 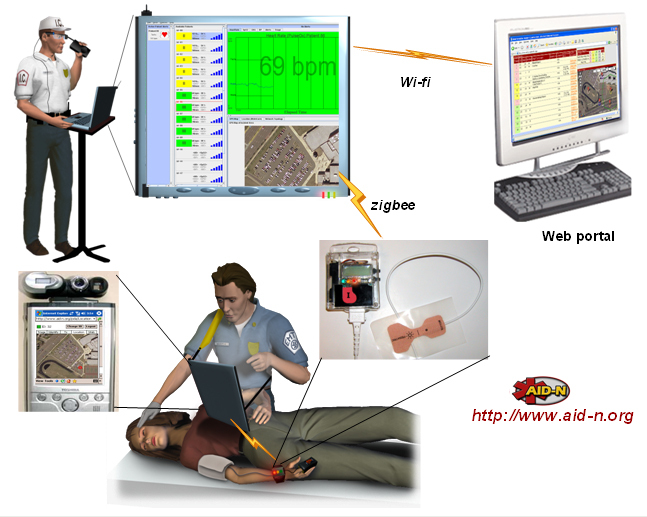 To improve inference accuracy, the system automatically detects the sensor position on the user's body and selects the most relevant inference method dynamically. 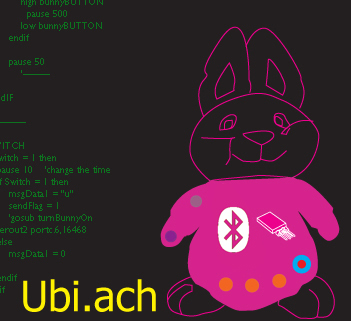 UbiREAL is a Smartspace simulator which realistically reproduces behavior of virtual devices and ubiquitous application softwares. It also reproduces changes of physical quantities in consequence of operations of virtual devices in the 3D space. UbiREAL consists of the following four functions. 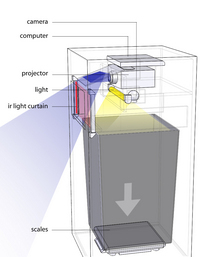 (i) 3D space visualizer for the virtual Smartspace; (ii) Network simulator for wired and wireless communication between devices; and (iii) Simulator for physical quantity changes in Smartspace. 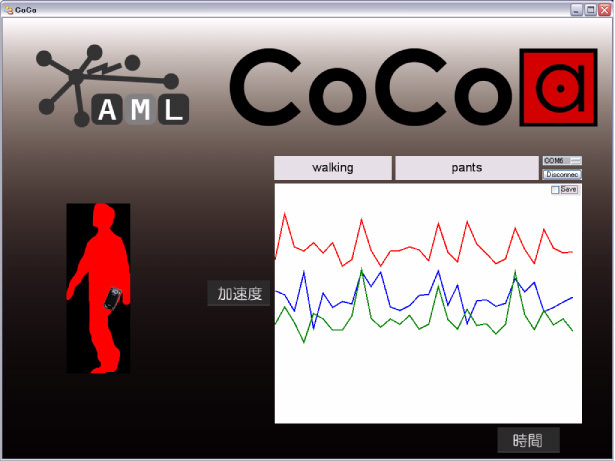 We will show a simulation of rule-based context-aware application in a Smartspace. 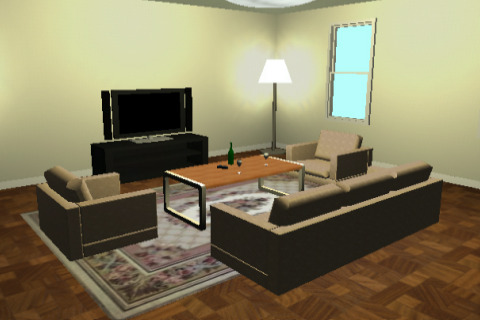 When simulation starts, the virtual inhabitants move and manipulate virtual devices as specified, the devices operate and communicate with each other, and physical quantities like temperature and humidity in virtual rooms changes. These can be observed through 3D visualizer in real time. Some of context-aware rules are linked to real devices which can communicate with virtual devices using UPnP protocol. 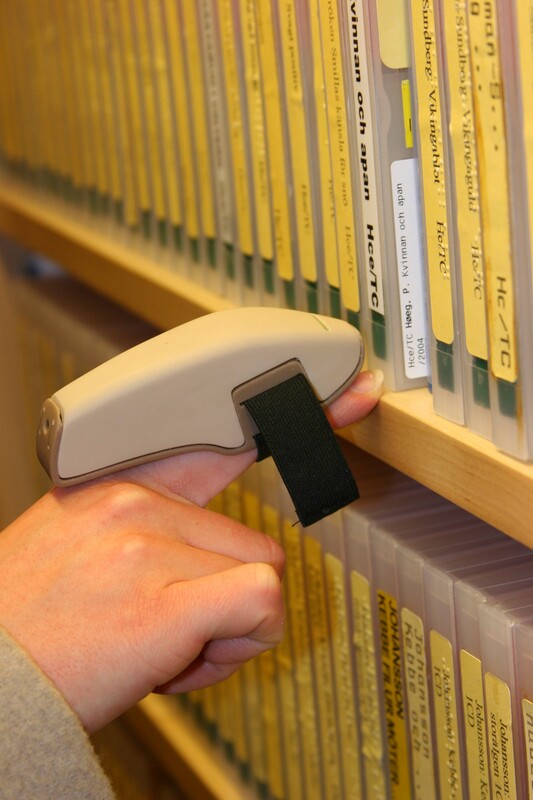 AudioIndex allows the visually impaired to browse and search for audio books within a public library without the need for library staff guidance. The system allows the user to point at objects in the library environment, typically audio books and bookshelves, to get audio feedback about their nature, including the audio book’s author, title, and a summary, in the form of synthesized speech. 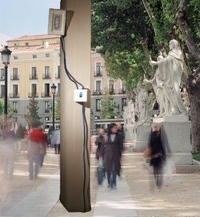 The prototype demonstrated has been designed to be a light-weight and appliance-like mobile system, consisting of three interconnected physical parts. The main device is worn around the neck using straps; second, an earpiece provides the user with audio feedback; and third, a small wireless pointing device is worn on the index finger. The AudioIndex prototype is part of a larger design effort undertaken at Umea Institute of Design, Sweden, to make public libraries more accessible, i.e. to try to find ways for the services provided by the library to be accessible for all members of society. 1 East Japan Railway Co. This demonstration presents our Touch and Step Navigation system. 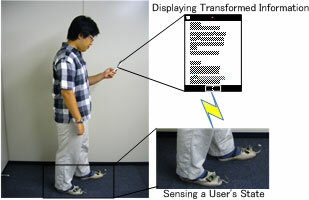 This Navigation system guides a person with voice message only by touching the Signboard or stepping on a Carpet electrode. It uses two new technologies: the RedTacton, a Human Area Networking technology that uses human body surface as a transmission path, and the VoiceUbique, infrared wireless audio reception unit using 1-bit quantizing transmission technology. 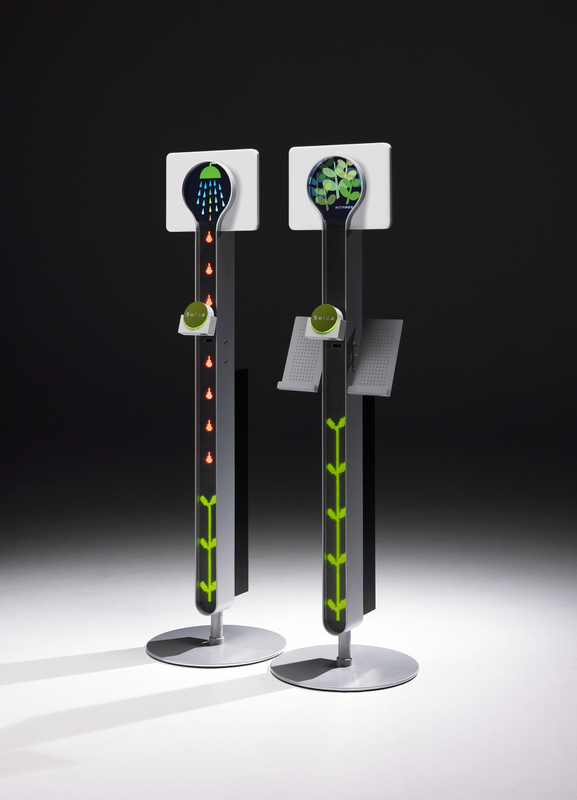 The Touch and Step Navigation is intended to guide customers who are lost in public space. 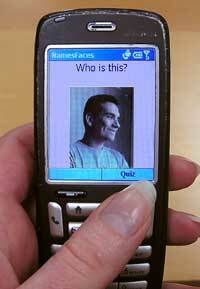 Technology today has become more than disruptive to us users with pagers, cell phones, instant messaging, and different alerts on our computers. These 'helpful means of technology' have slowly become more than intruding to the primary task at hand. This breaks our concentration and hence, interrupts our work-flow. When creating Ubi.ach, we attempted to bring that extra layer of information to the user, but by a means of peripheral, sensory awareness. In search of using calm technology, we have come up with a friendly-looking stuffed-doll that connects to its' owner's personal email account. Using text analysis algorithms, text-to-speech technology alongside with radio frequency and bluetooth communications we've built an alternative first interface for email connectivity. MASTABA is a household Digital Shrine in the future. Digital Shrine, in our definition, is the thing with which someone hands down one's memories to posterity. And it consists of "digital data" and "physical viewing system". In case of MASTABA, we designed it as the Digital Shrine including digital photo data with a physical space archiving and showing photos. Photos of Family members over some generations are archived with MASTABA. In the building of MASTABA, there are 100 stairways and a tabletop interface. User can select 0 to 99 ages by lighting each step. And he can view his own photos and his family and ancients' photos with operating the table. Media Technology Research Center, Dai Nippon Printing Co.,Ltd. One target of a ubiquitous computing environment is to create and activate communities in which people interact in a lively manner based on their interests and situations. To achieve that goal, we have been developing a "ubiquitous community assistance (UbiCoAssist)" for event spaces which since 2002 have rich contents and interactions among certain interest groups and myriad sub-communities. We have been developing the UbiCoAssist by elaborately fusing web support systems based on cyber world interaction and onsite support systems based on real-world interaction. 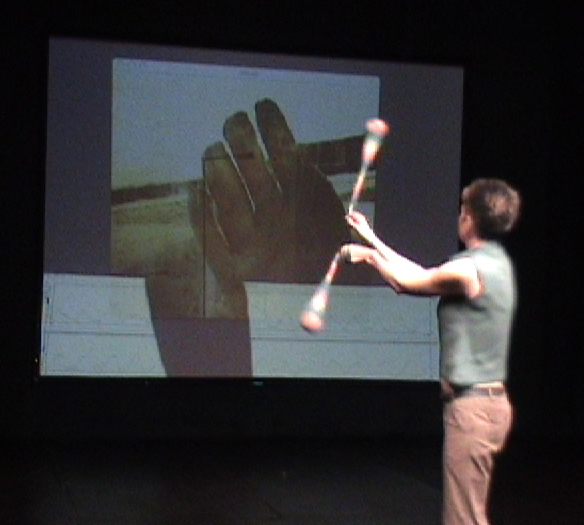 In 2005, we were kindly granted the opportunity to demonstrate the newest UbiCoAssist for attendees of UbiComp2005. 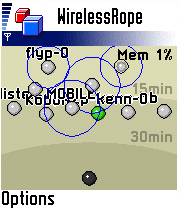 We further improved the UbiCoAssist for UbiComp2006. This paper briefly describes the system architecture and the characteristics of each sub-system. 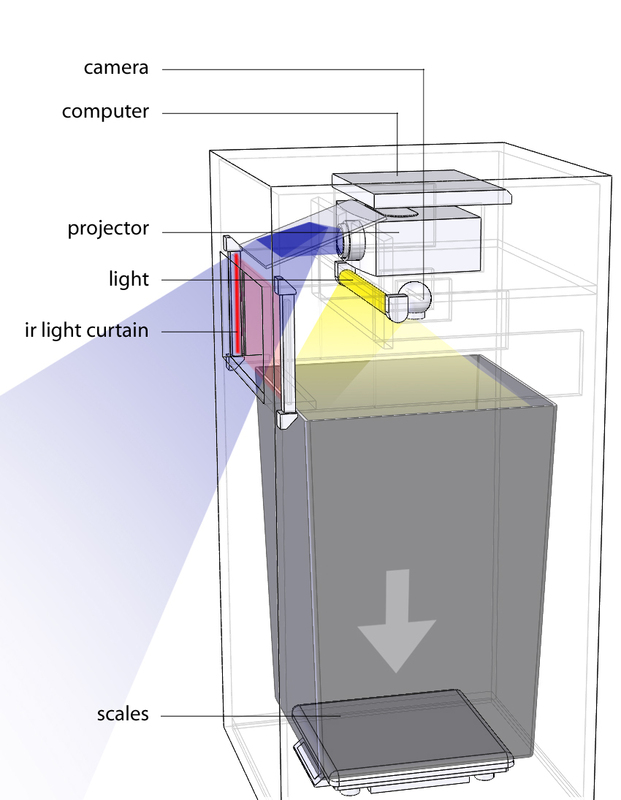 Automatic identification technology such as RFID promises to connect physical objects with virtual representations or even computational capabilities. However, even though RFID tags are continuously falling in price, their widespread use on consumer items is still several years away, rendering large-scale experiments with such an ''internet of things'' difficult. Much more ubiquitous are printed bar codes, yet so far their recognition required either specialized scanner equipment or custom-tailored bar codes - an equally significant deployment hurdle. We have developed a freely available EAN-13 bar code recognition and information system that is both lightweight and fast enough for the use on camera equipped mobile phones, thus significantly lowering the barrier for large-scale, real-world testing of novel information and interaction applications based on ''connected'' physical objects. This demo presents our main contribution: A toolkit, consisting of a J2ME client for the barcode recognition on camera phones and a corresponding Java based server for linking the recognized product code to free and commercial databases on the internet, as well as two simple prototypical services (applications) based on this toolkit. With these tools, researchers can quickly develop full-fledged information and interaction applications based on EAN-13 product codes, and deploy them with a simple download to potentially large user bases in a much more effective manner than with the previously necessary special scanning equipment. We hope that this ''low tech'' version of bridging the gap will allow the community to quickly develop and try out more realistic and widespread applications, and thus gain real-world experiences for better jump-starting the future internet of things, today. The demonstration Wireless Rope aims to study large scale Bluetooth scanning for proximity detection with consumer devices and its effects on group dynamics during the conference. Participants can download a program for Java enabled phones, which collects information of surrounding devices by Bluetooth. Users can interact through a GUI with members of an existing group or form a new group. All connection information will be collected by tracking devices and a connection map of all participants can be obtained via the web. 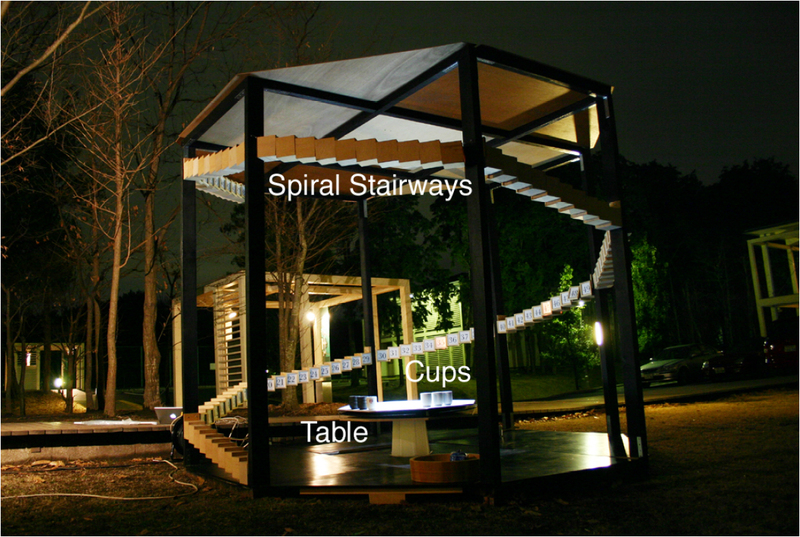 The Pileus System is a tangible browser to make rainy days fun. The Pileus Umbrella and the Pileus WebService construct the system. At the demo, personalized photo-logs are projected on a screen of the Pileus Umbrella . 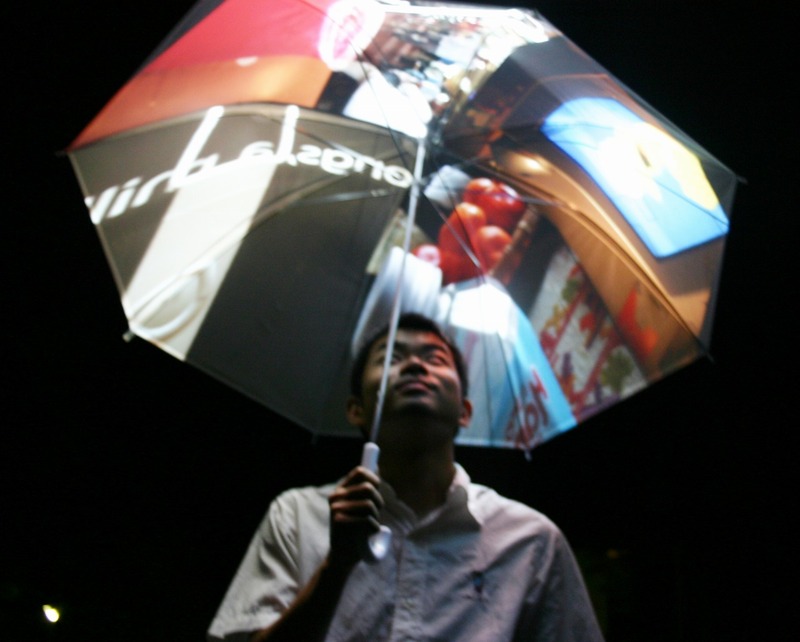 User can take photos with a camera on the top of the umbrella. Taken pictures are uploaded and shared on Flickr with some context tags immediately via the Pileus WebService. 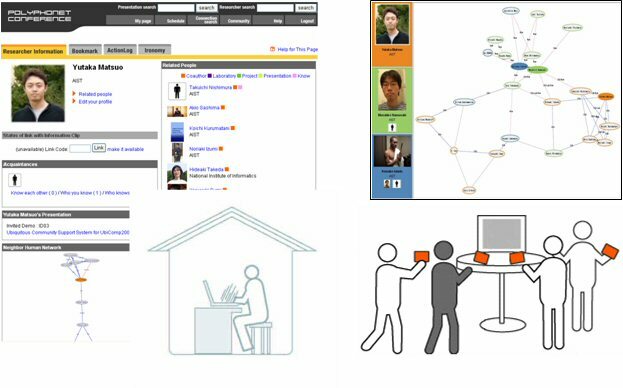 The grip module has a web connection and ID for a social contents sharing for the WebService. 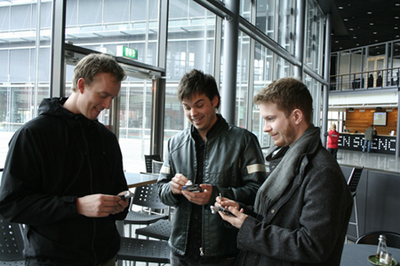 Snapping action is used for a browsing operation with an accelerometer installed on the grip. these operations easily in a hand. 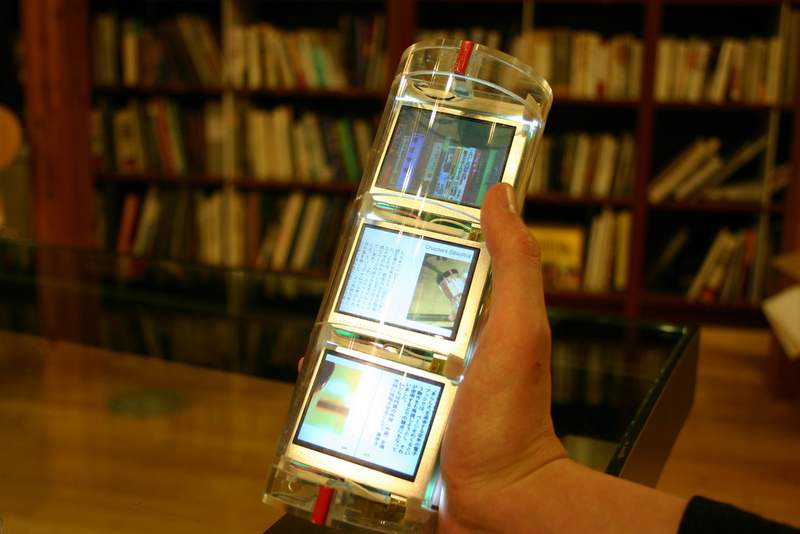 Therefore, it makes users experience a totally different way of reading from traditional books or e-books. Using BiblioRoll gives not only an experience of reading but a new experience of gaining knowledge. 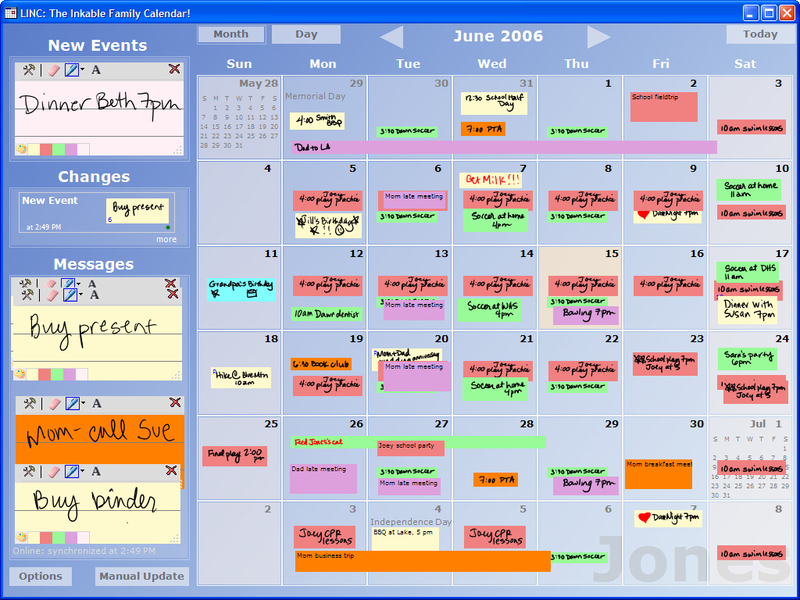 LINC is a ubiquitous digital family calendar designed to be as easy to use as a paper calendar and available wherever it might be needed: home, work or on the go. In our demo, we will highlight the ubiquity and simplicity of family calendaring using LINC. The main LINC client was prototyped as an information appliance using a Tablet PC. The mobility of the tablet and the ability to install LINC on any desktop PC turns the family calendar into a ubiquitous information source within the home. By using ink as the primary input method, LINC allows users to enter exactly what they want for an event as well as draw pictures and symbols. LINC Mobile provides access to the family calendar on a Windows Smartphone, while LINC Web makes the calendar available in the Internet Explorer web browser. These two interfaces facilitate calendar browsing while at work or mobile. We describe an anonymous communication system 'Pollin,' which enables people to express their opinion only by touching Smart Card ticket 'Suica' or IC chip embedded cellular phone. 'Pollin' has an IC card R/W and LED panels to display count of people's touch, as a result show people's opinion and messages in a public space. As mobile camera phones become ubiquitous the practice of photography changes. Camera phone pictures are usually taken with sharing in mind. Meanwhile, publicly sharing photographs online has become increasingly popular with websites such as Flickr. Push!Photo is a mobile photo sharing application where photos can be made public and immediately accessed by anyone nearby. The application also automatically searches for photos on nearby devices to find interesting and relevant photos. Push!Photo shows how it is possible to share digital photos just as easy as paper photos. Embedded sensing technology has gradually shifted from traditional domains, such as the scientific, engineering, and industrial areas, to a broader and more diverse space involving citizen-initiated sensing in personal, social, and urban contexts. 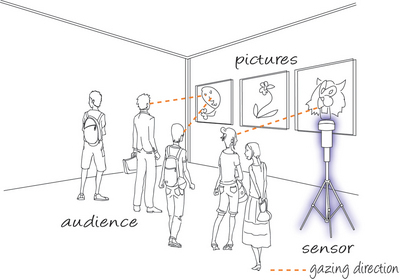 Applications are emerging which draw on sensed information about people, objects, and physical spaces. These applications enable new kinds of social exchange: by promoting collection, processing, sharing, and visualization of information. They require new algorithms and software mechanisms since the systems involved are often widely distributed, intermittently connected, and heterogeneous in nature. 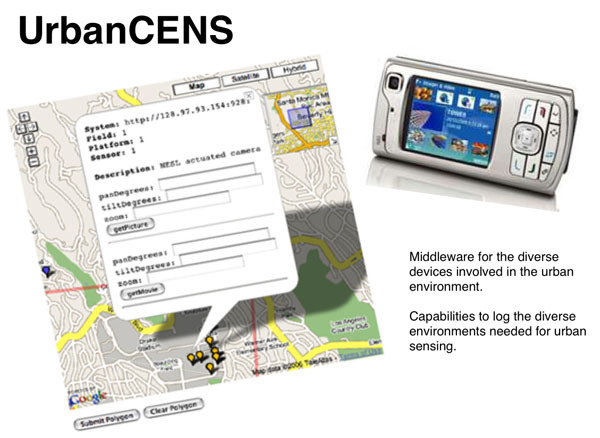 To address these issues, the UrbanCENS project introduces a middle-ware architecture that enables a standard method to manage, query, and interact with networked sensing systems. The architecture defines an XML schema language, ESPml, to describe sensing systems and a framework that provides the basic capabilities to handle their diverse needs. Furthermore, a set of example systems, focused on urban sensing, are implemented in the platform with a geo-centric end user interface. Special attention is placed on visual and acoustic sensing with an emphasis on tools for capturing, tagging, and categorizing an environment. We propose an architecture of context-aware applications based on a simple human state model. It enables an application to acquire the human state without considering details about utilization of many kinds of sensors. In our demonstration, we show how the components in the architecture cooperate with each other and perform human-state-dependent behavior on a personal device using mules equipped with pressure sensors. 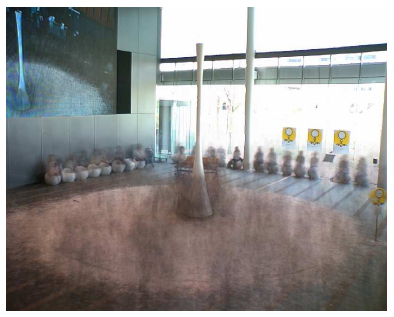 We propose the system that enables to share the contexts from distant places by combining images for 30 minutes fetched from network cameras into an alpha-blended image. It is effective for depicting the passage of time and protecting the privacy of people on camera. We propose the notion of "degree of attention" in this demonstration. In the Web world, the popularity is being commonly measure. Likewise, we believe that a place or an object that is being paid attention can be detected. In our prototype system, we analyze the direction of a person's face is extracted, collect the multiple directions, and thereby identifying the target object. Flooding is becoming an increasing problem. 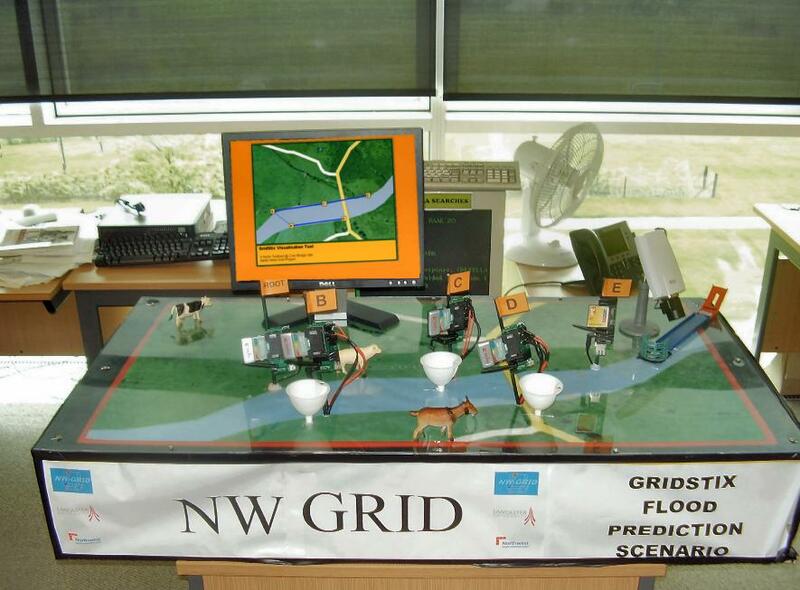 As a result there is a need to deploy more sophisticated sensor networks to detect and react to flooding. This paper outlines a demonstration that illustrates our proposed solution to this problem involving embedded wireless hardware, component based middleware and overlay networks. There is more to our urban lives than precision location systems, restaurant recommendations, and familiar desktop applications redeployed mobile phones. While many of these tools will indeed become vital urban necessities that improve our lives, we are left to wonder the role of technology in touching the other more emotional aspects of urban living. 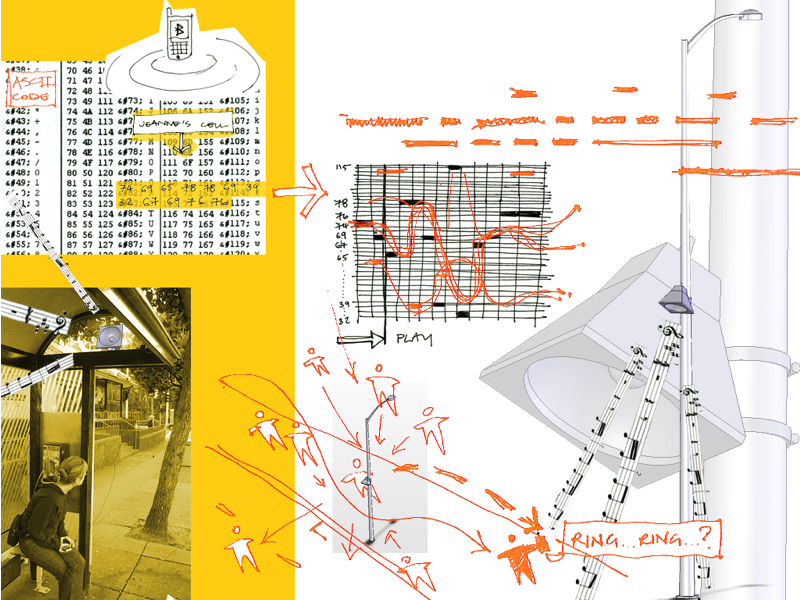 In concert with our urban productivity tools, we envision the existence of a wider range of new urban objects that broaden our perspectives on technology and promote our personal and collective wonderment of place, people, and life. 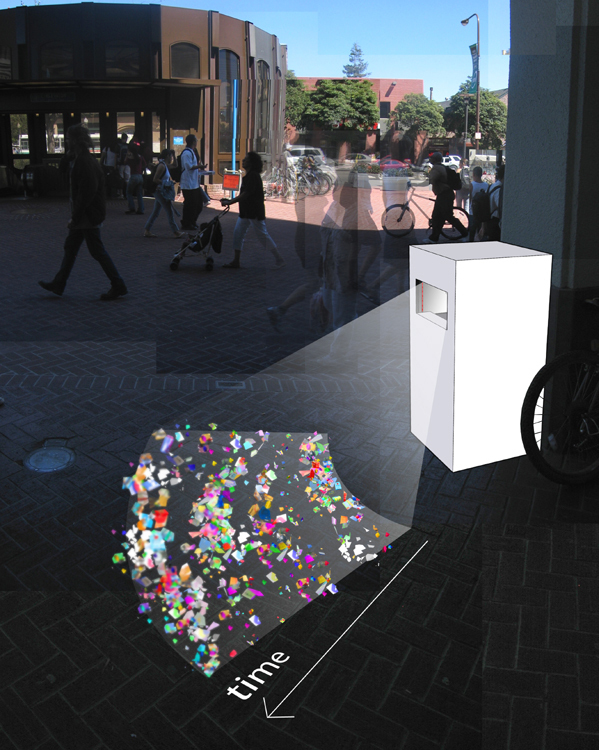 Using of the Urban Probes research methodology of deep bodystorming, intervention, interviews, and artifact production, we demonstrate the deconstruction and novel physical rethinking of technology surrounding a ubiquitous urban object - the public trashcan. No longer confined to our offices, schools, and homes, technology is expanding at an astonishing rate across our everyday public urban landscapes. From the visible (mobile phones, laptops, and blackberries) to the invisible (GPS, WiFi, GSM, and EVDO), we find the full spectrum of digital technologies transforming nearly every facet of our urban experience. Many current urban computing systems focus on improving our efficiency and productivity in the city by providing "location services" and/or interactive navigation and mapping tools. While agreeing with the need for such systems, we are reminded that urban life spans a much wider range of emotions and experiences. Our claim is that our successful future urban technological tools will be those that incorporate the full range of urban experiences - from improving productivity and efficiency to promoting wonderment and daydreaming. Hullabaloo presents the first in a series of new public artifacts called "Objects of Wonderment" that are designed to radically expand our expectations of mobile phones as they shift beyond merely connections to people and begin to interface directly to physical places. 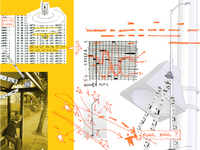 Combining simple bluetooth sensing technology with a newly fabricated public object, Hullabaloo dynamically generates new urban sonic experiences that reflect the verve of the people that transit it. This new sonic milieu not only osmotically permeates the city landscape but can be taken away as place-based ringtones. We demonstrate a Digital Live Art system for using acceleration as a medium for controlling visual imagery and audio soundscapes. Our system is multi-channel and wirelessly networked which encourages communal engagement through naturalistic interaction. We integrate the ancient Maori art of poi to create a DIY performance of highly mobile Digital Live Art. The novelty of our work lies in the combination of acceleration and wireless multi-channel, robust devices for Digital Live Art. 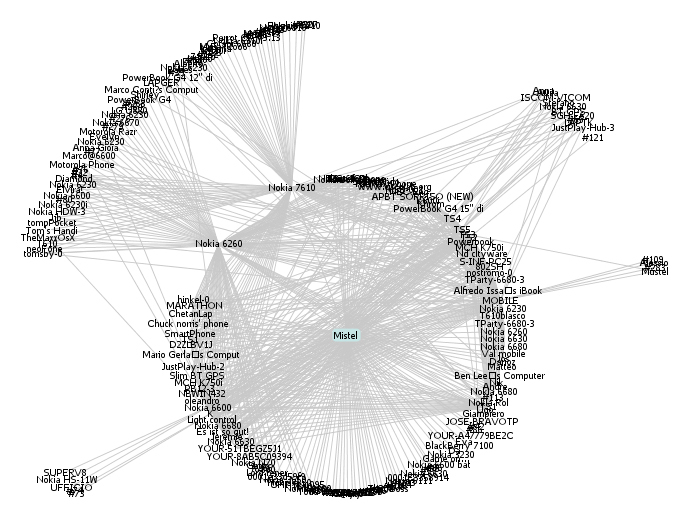 We present a framework for information discovery in proximity. 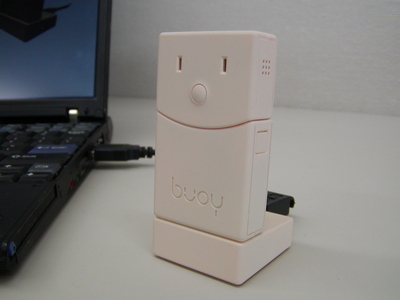 Discovery is based on a device called Buoy which performs wireless information advertisement and discovery on behalf of the user. Features of the framework include a standard data format, and user control and developer control interfaces, in addition to API. Broadcast data is minimized to achieve fast discovery and low power consumption. The user control interface provides a convenient way for a user to configure Buoy for advertisement and discovery that does not require any knowledge of programming language. The developer control interface helps a developer to quickly develop discovery applications. Electronic triage tags automatically sense and transmit patient vital signs. 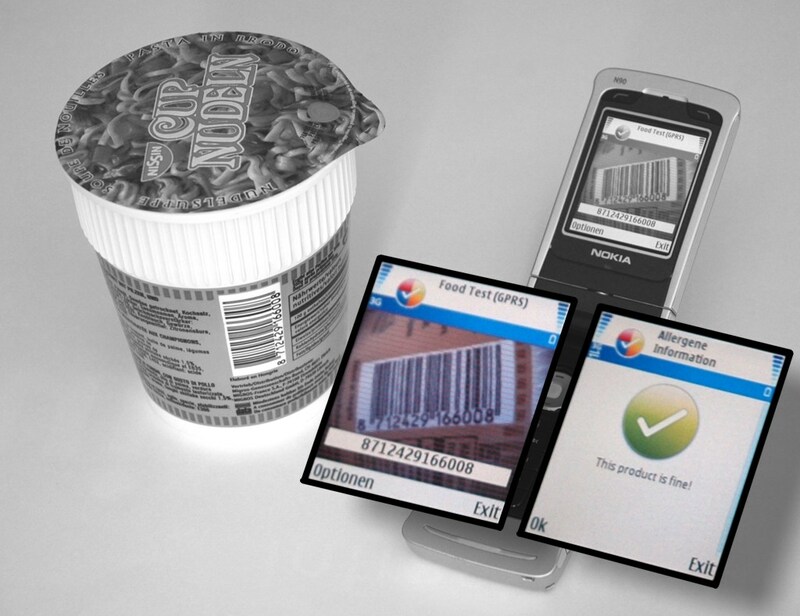 These electronic tags are developed as an alternative to paper triage tags. Base station laptops, PDAs, and associated mobile devices provide real-time patient vital sign monitoring and location tracking capabilities. These devices provide an alternative platform that can be used in place of the paper-based documentation tools currently available to EMS. Web portals facilitate real-time information exchange among distributed emergency response teams such as Emergency Departments, Incident Command Posts, and Public Health Departments. These provide a time-saving alternative to the voice communication radios currently used by EMS. These technologies interoperate to provide pervasive tracking and monitoring of patients at all stages of the emergency response process, from the disaster scene, onto the ambulance, and into the hospital. We introduce a novel way that allows non-expert users to create smart office. To establish this goal, we have developed a sensorized fabrics called gSmart-Furoshikih, which has a built-in computer and sensors. Furoshiki is a Japanese traditional cloth that can be used universally such as a wrapping, tablecloth, and a cover. The fabric of Smart-Furoshiki can conducts electricity and the surface of Smart-Furoshiki can recognize RFID tags. Smart-Furoshiki is light and easy to use and can be used based on cloth specific affordance such as laying, covering and hanging. In the conference we are planning to show the usage of Smart-Furoshiki in various situations. 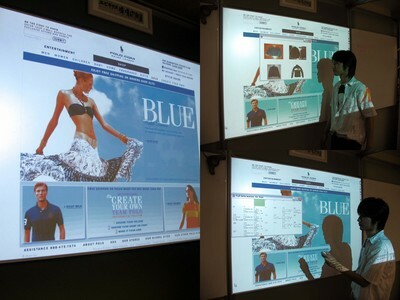 This article proposes a realization of an interactive wall system as in the movie Minority Report. 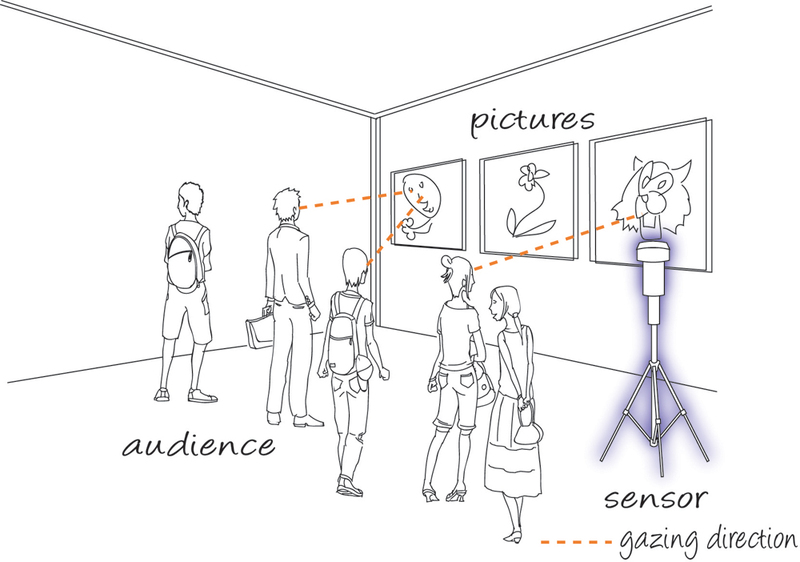 We concentrate on three research topics: user context recognition, context-aware content generation, and an interactive interface with walking people. The above three are integrated with each other to realize comfortable message delivery in the public site. This demonstration will show how mobile devices and just-in-time interactions can be used for microlearning. We will demonstrate our microlearning application in its 'names and faces' learning mode, using a database of UbiComp conference attendees that we will acquire as part of the demo itself (but prior to the conference). The application, which has an extremely simple interaction model, will help UbiComp attendees learn the names and faces of their fellow UbiComp conference attendees prior to and during the conference in 20s bursts distributed throughout the day. Haggle is a software architecture for mobile devices, such as smart phones, PDAs and laptops, allowing applications to use peer-to-peer and mobility-based connectivity as easily as they currently use infrastructure. 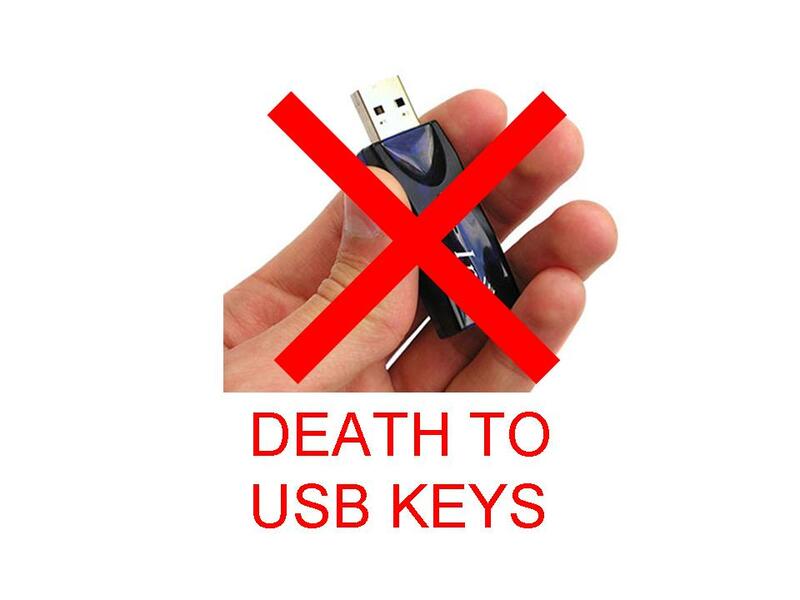 This is an important capability for many UbiComp applications due to the dynamic connectivity environment faced by the mobile devices employed. We illustrate Haggle's benefits using the examples of email and web browsing. Crossroads is a two-person, real-world strategy game in which players compete to control urban territory. While the players attempt to organize the city according to their tactical goals they must contend with Baron Samedi – an invisible spirit who wanders capriciously through the city, spreading chaos wherever he goes.